^ "Cyril Clarke named Virginia Tech executive vice president and provost" (Press release). Virginia Tech News. 2019-01-07. ^ Hahn, T. Marshall (May 13, 1970). "Hahn's statement on the Williams occupation". Virginia Tech Special Collections. Archived from the original on May 21, 2018. Retrieved 2018-08-13. ^ "Virginia Tech Off-Campus Properties". 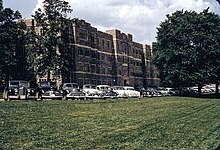 History and Historical Data of Virginia Tech. Virginia Tech. Retrieved 2018-08-13. ^ "Campus Carry and the public history of the gun debate". National Council on Public History. Retrieved 2019-03-28. ^ "Va. Tech gunman kills officer, later found dead". www.cbsnews.com. Retrieved 2019-03-28. ^ Tavernise, Sabrina; Williams, Timothy; Goodman, J. David (2011-12-08). "2 Dead of Gunshots as Violence Revisits Virginia Tech". The New York Times. ISSN 0362-4331. Retrieved 2019-03-28. ^ "Armed suspect stole car before killing Virginia Tech officer". CNN. Retrieved 2019-03-28.